England – April and November of 2012 – We were hosted by the Fisher Singers in Harrogate, England in April and they traveled to San Diego in November of the same year. 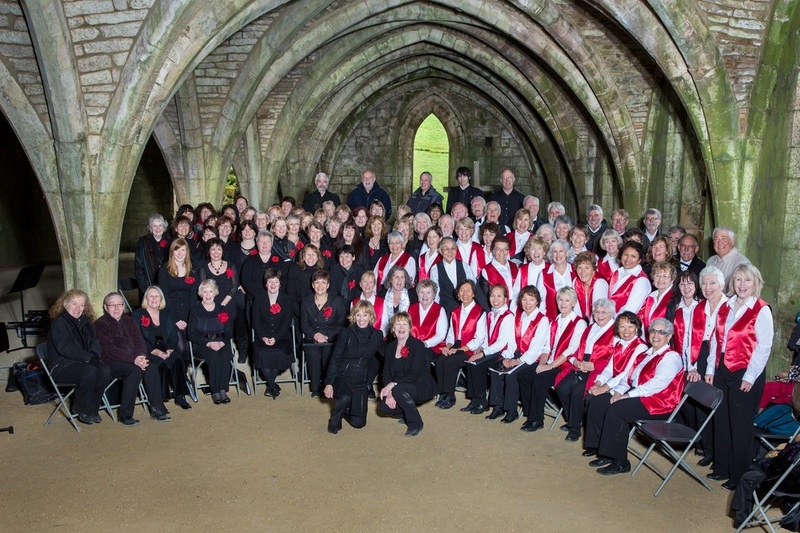 Come with me out to Fountains Abbey for Saturday afternoon's concert. Set on a massive tract that before the time of Henry VIII housed a Cistercian monastery, the institution consisted of self supporting farms and a striking cluster of buildings resembling a scaled down Westminster Abbey. When Henry and the Roman Catholic Church parted ways on bad terms, he confiscated all Church property, disbanded all monasteries and had many of the structures destroyed. Fountains Abbey's cathedral-like center lost its roof, leaving a skeleton open to the sky. One of the few covered spaces to survive is called the Solarium, a very large space perhaps the size of several NBA basketball courts, whose rudimentary stone-block vaulted ceiling is supported by a matrix of arched columns spread across it like dozens of crosses on a gigantic tic-tac-toe matrix. The floor is earthen; the walls just open arches. Traveling with a choir is like traveling with a group of close friends, in fact it is traveling with a group of close friends! 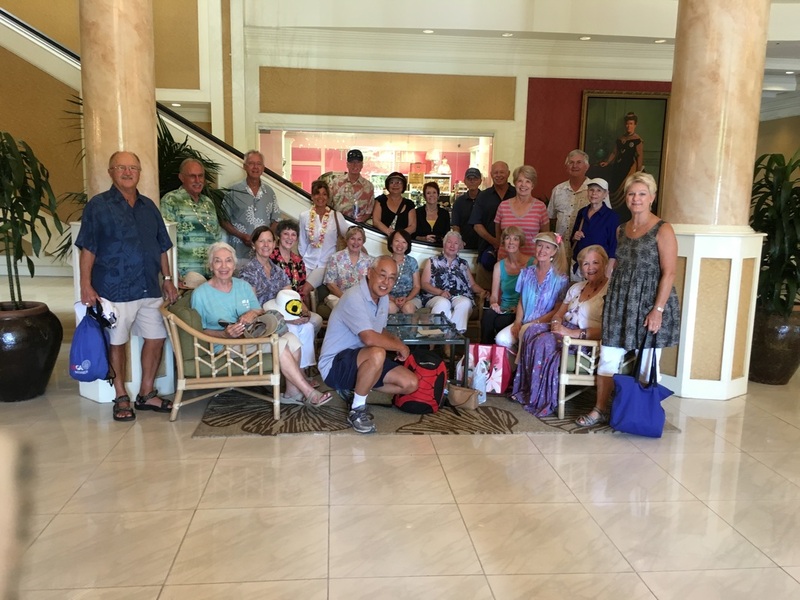 Oahu, Hawaii - November 2015 – We traveled to Oahu and were hosted by the Windward Choral Society. They will likely reciprocate and travel here sometime in the future. We also participated in the 19th annual Thanksgiving Concert, hosted by the Honolulu Chinese Christian Chorus. 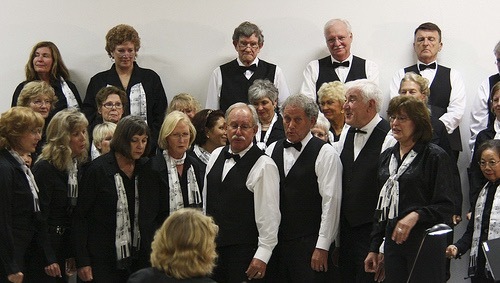 It included 9 other choirs and three dance groups. 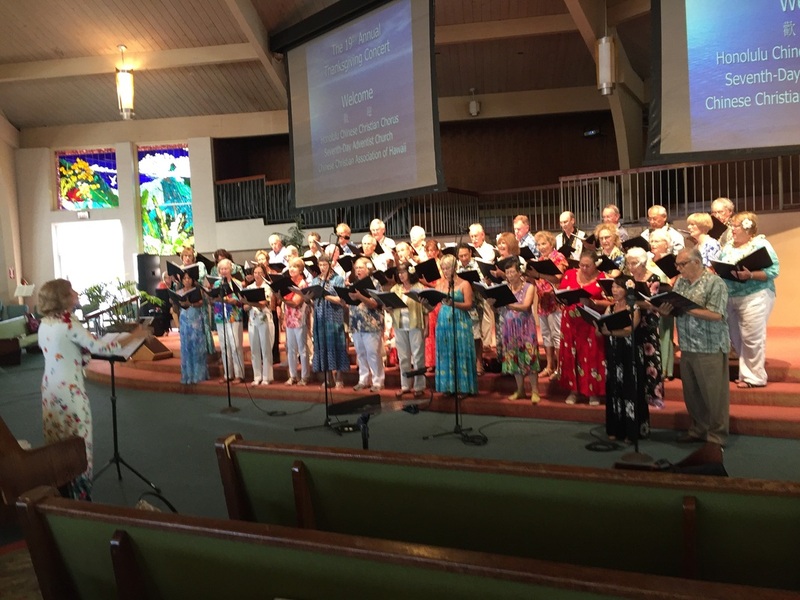 Our hosts on Oahu, the Windward Choral Society Choir, under the direction of Susan McCreary Duprey. 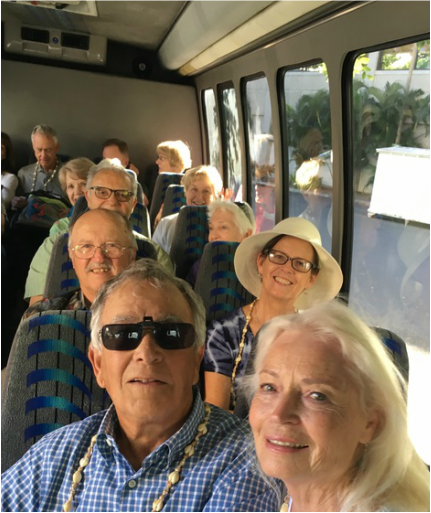 On the bus from the airport to the hotel in Waikiki Beach. Stopping to pose at the Kamehameha statue in front of the palace in downtown Honolulu, one of the stops on the city tour. 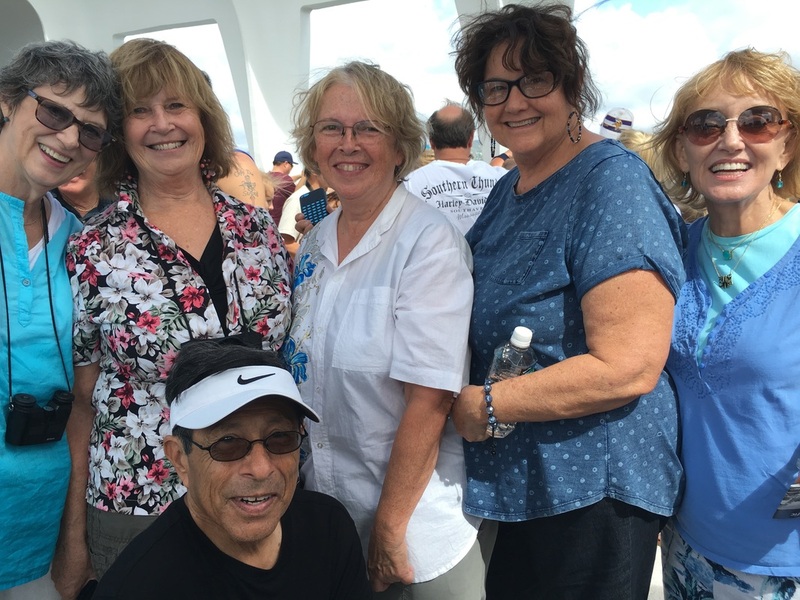 More happy tour people at the Arizona Memorial. A person has got to eat. 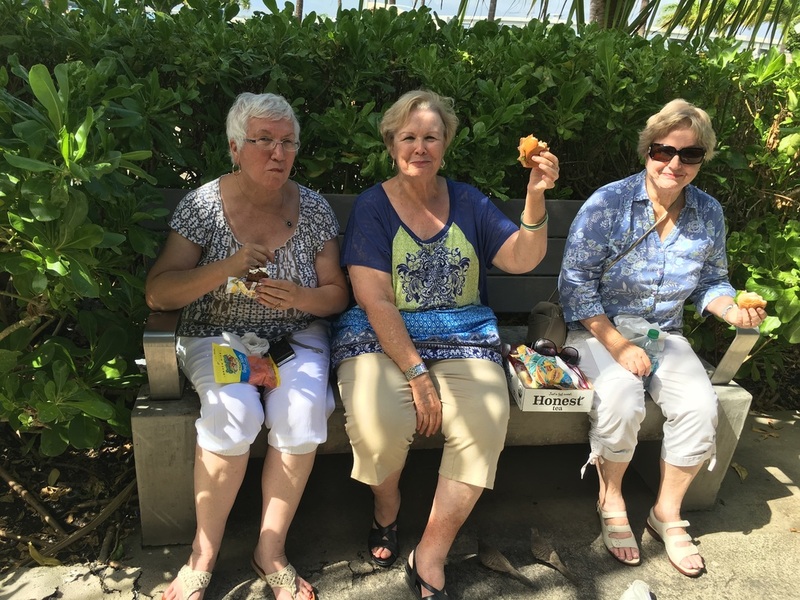 Lou, Lorea and Norma grabbing a bite after the Arizona Memorial visit. 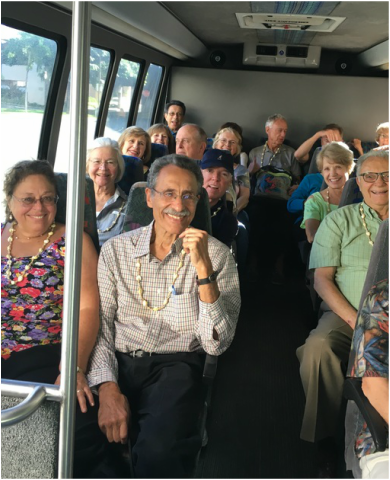 More touring, this time the group headed to the Polynesian Cultural Center. 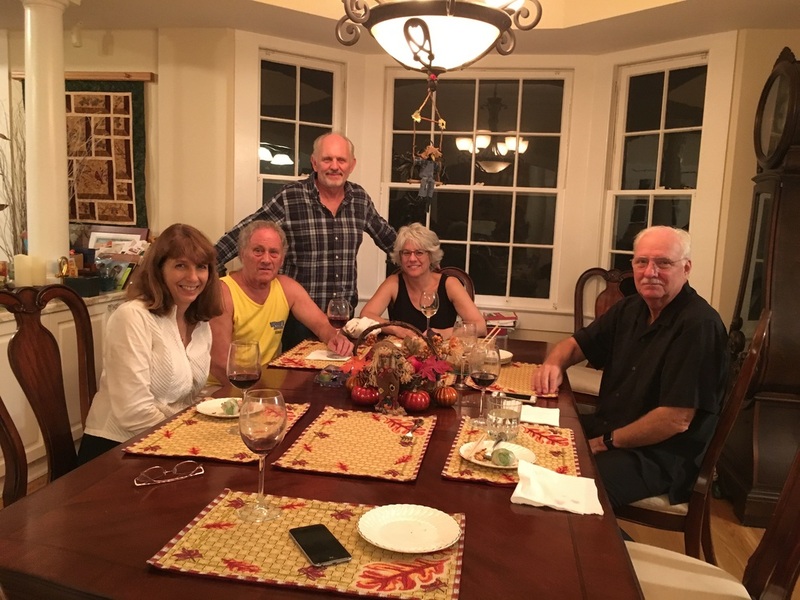 Kristi, Denny, Tim, Cindy and Gary at our hosts house. Tim is Eunice's brother. 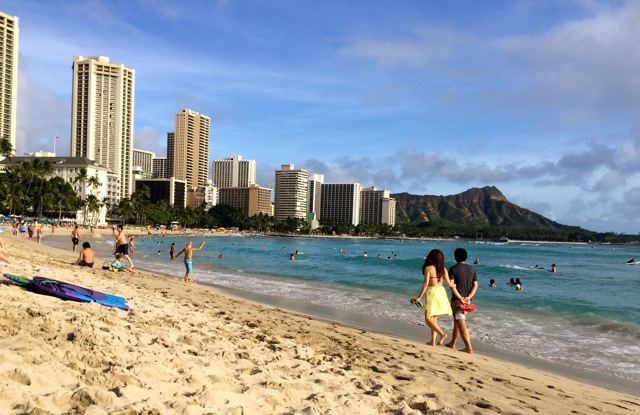 Diamondhead and the towers of Waikiki. Another view from Ken Banda. 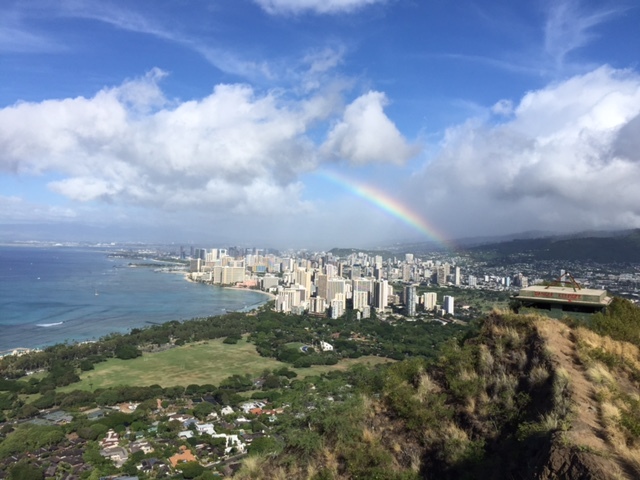 Stunning photo from Diamond Head with the rainbow over Honolulu. Photo from Ingrid. 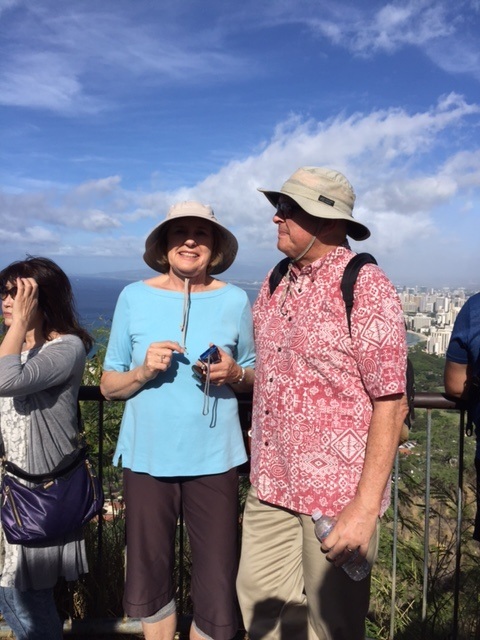 Virginia and her husband from the top of Diamond Head. Photo by Ingrid. It's a jungle out there. Not all swaying Palms. 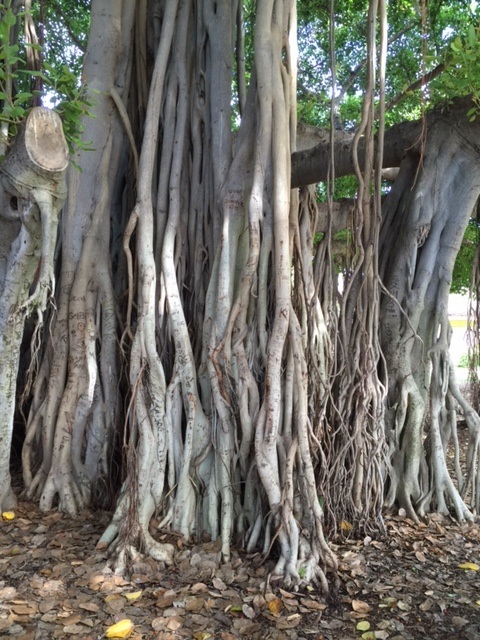 Here is a Banyan tree. Ingrid are you in there? "How fresh and refreshing. These tunes from all religions, and horizons, filled with deep meanings." 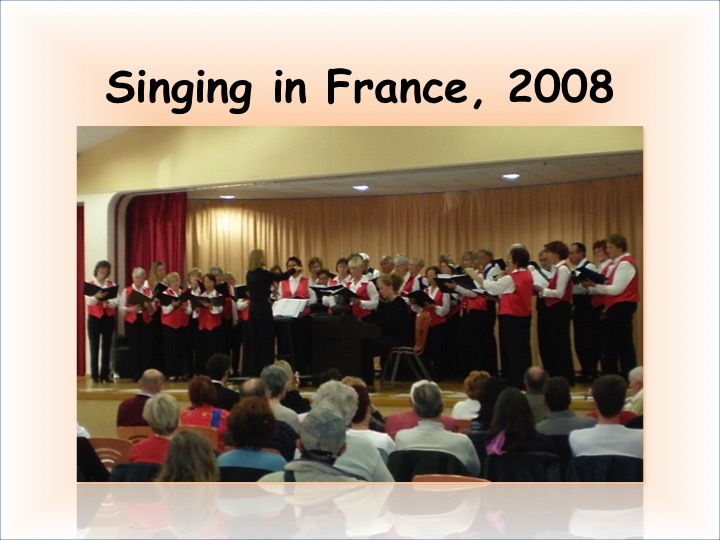 France - June of 2007 and April of 2008 – Choral Exchange with L’esterelenco, a seasoned, well-traveled choir from the south of France. 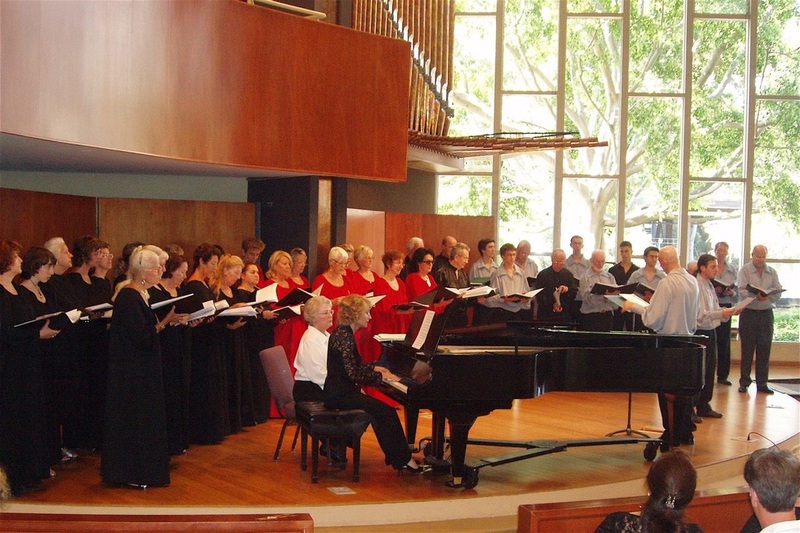 They have traveled all over the world in choral exchanges and will celebrate their 50th anniversary in 2016. Pacificaires and Cedar Center choruses are planning to join them in the celebration. Isn't it fun when there is great joy in the work? Close your eyes and imagine . .coming to it walking as we did through cold rain across spacious lawns left the way they originally existed. Deceived by moments of sun earlier in the day, we'd left our umbrellas behind. Cold and wet, the Pacificaires and Fisher Singers doffed their coats and assembled in formation near one end of the space, facing some 60-70 folding chairs brought in for the lucky few in the audience who claimed them. No lighting, no sound system, no chairs for the singers. Hear the wind blowing cold through the space and the rain pouring down "outside." Somehow there's an electric keyboard hushing the quiet chatter and then voices rising to surreal thunder across the stone space: "Gloria! Gloria! In Excelsis Deo!" New York City - Lincoln Center, Avery Fisher Hall – June of 2012 – Sung ‘The Messiah’ with about 200 other singers from around the country. New York City - Carnegie Hall - June 2014 – Performed in the Masterworks Series. Sang the Bluegrass Mass entitled The ‘World Beloved’ by Carol Barnet. 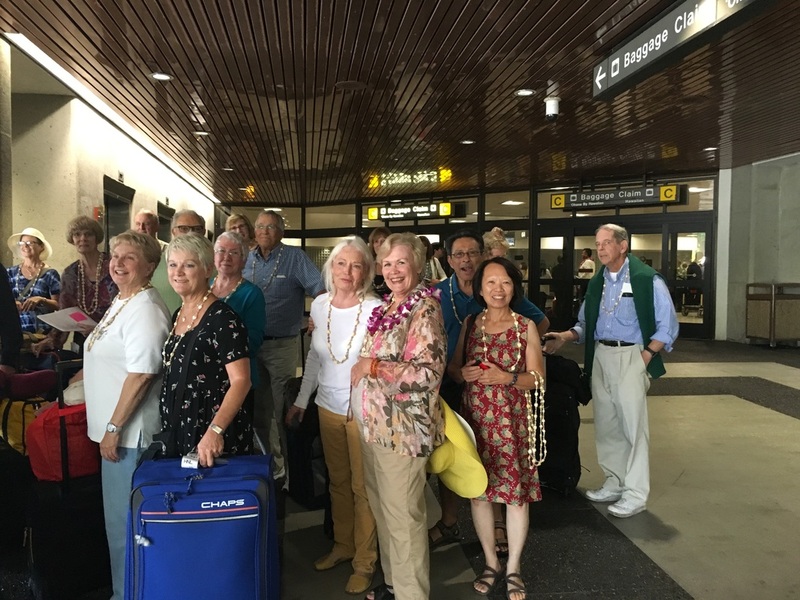 Smiling members arriving at the Honolulu Airport. Same bus, more smiling members. 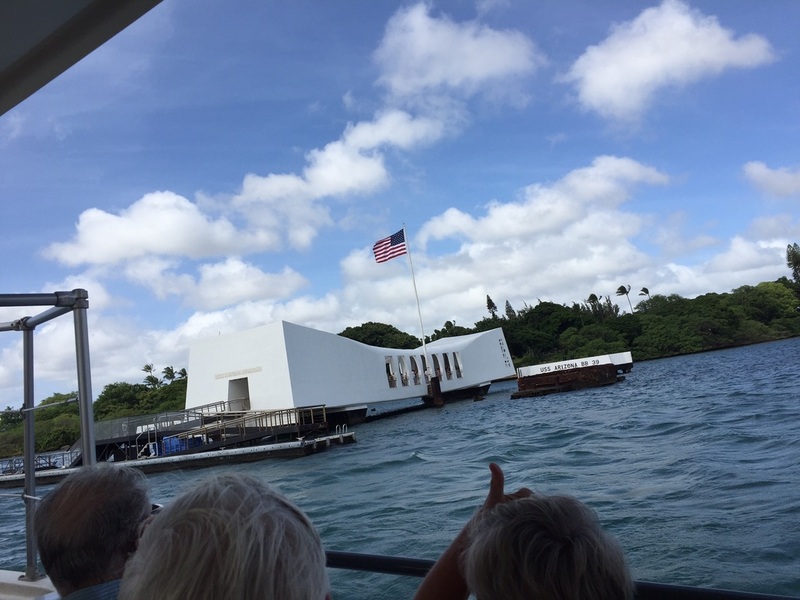 Another stop on the city tour, the boat to the Arizona Memorial in Pearl Harbor. A shot of the Arizona Memorial. 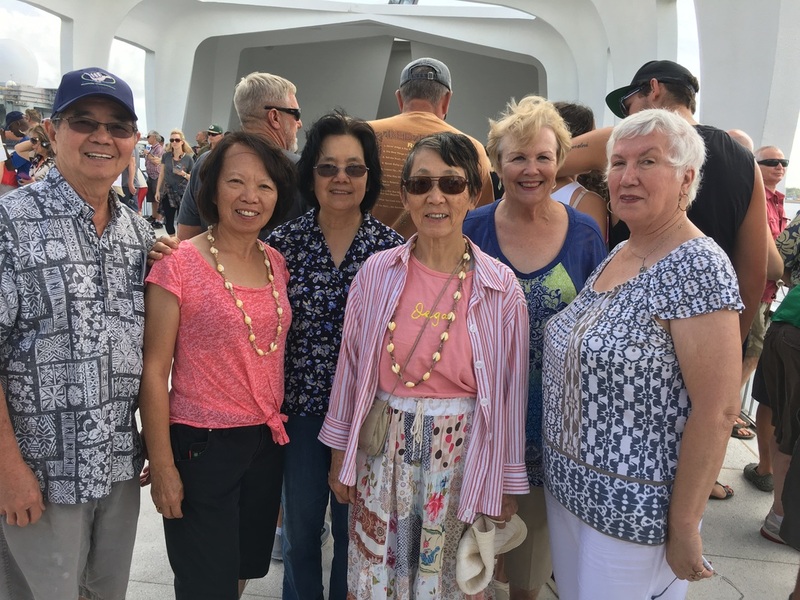 A few more windblown visitors at the Arizona Memorial. 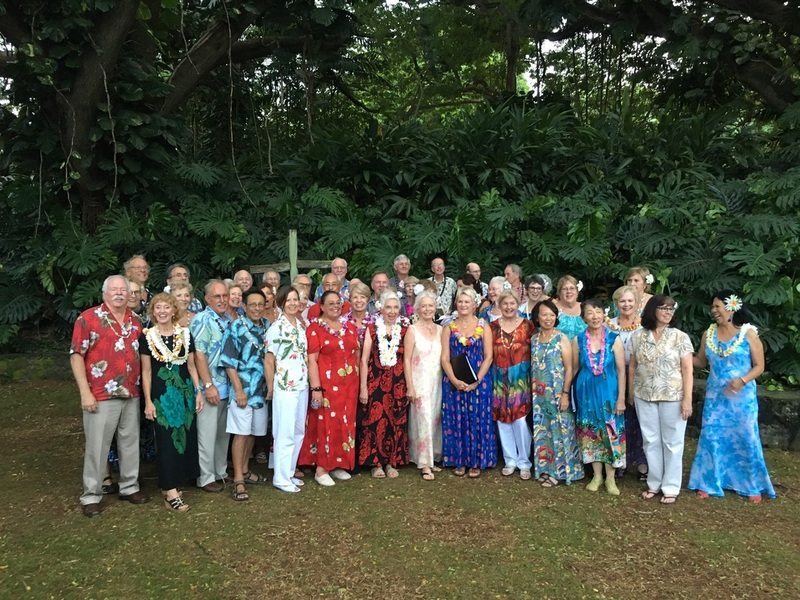 The full Pacificaires/Cedar Center choir after the Saturday concert with our Hawaii hosts. 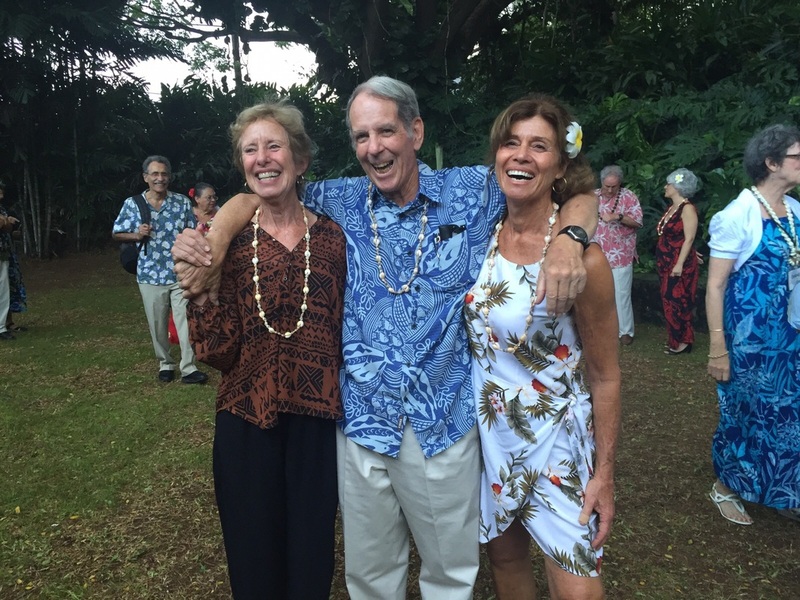 The Del Mar Trio after the concert. Jan, Mac and Pam strike a happy pose. 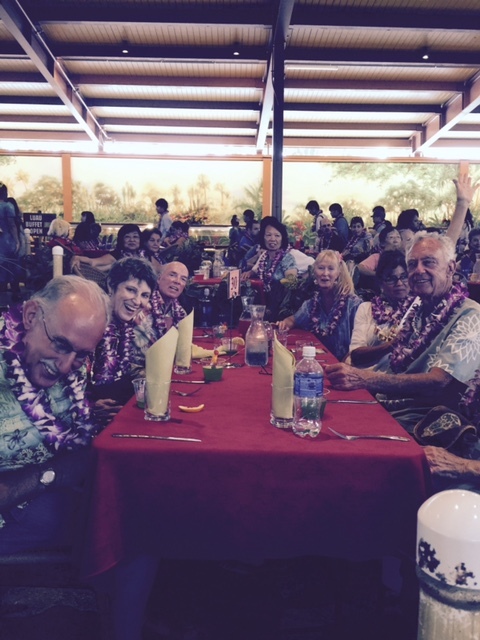 More laughter from the Polynesian Cultural Center tour captured by Ingrid. 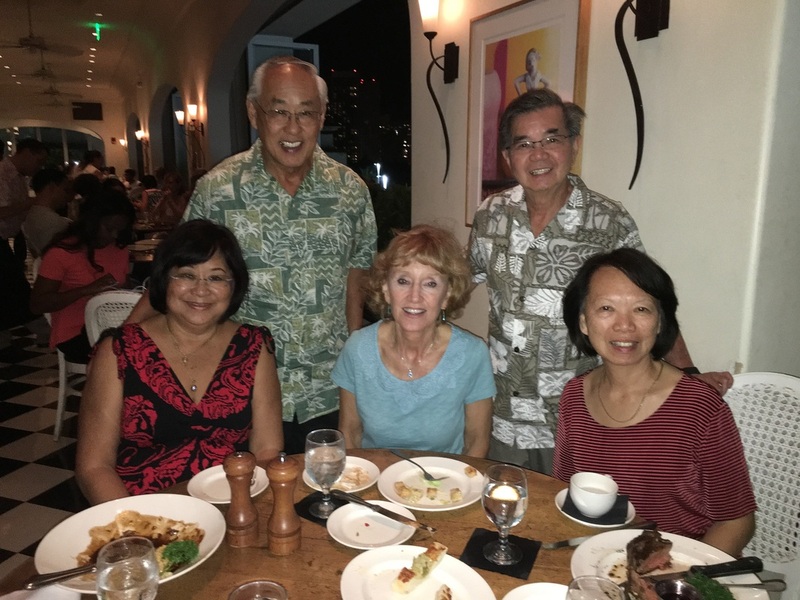 Sandy, Steve, Eunice, Tim and Susan at Longhi's Restaurant in Honolulu. 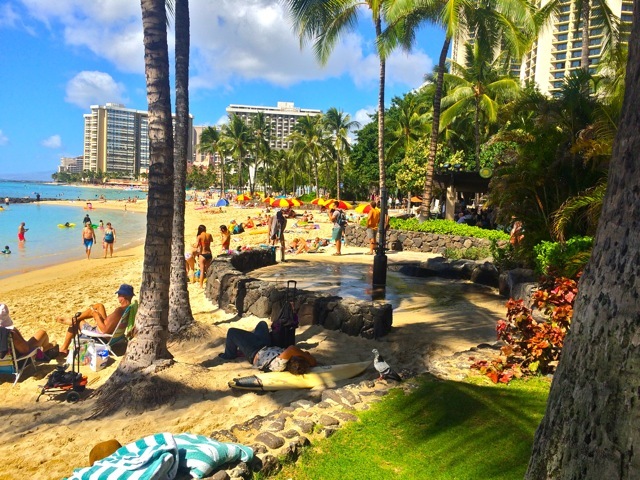 It's always paradise on Waikiki. Photo by Ken Banda. 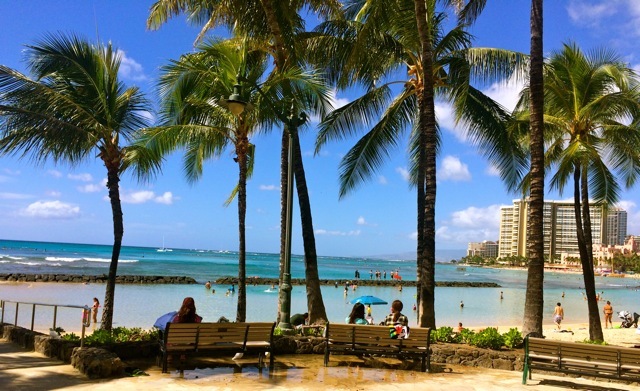 Swaying Palms, easy days on Waikiki. Again captured by Ken Banda. Warming up for the Chinese Festival in Oahu. Photo from Susan Yeun.